Launched in 1999, at the same time as the Drifter 800, the Drifter 1500 looks very similar to its smaller sibling. Underneath the retro styling however, it is a very different machine. 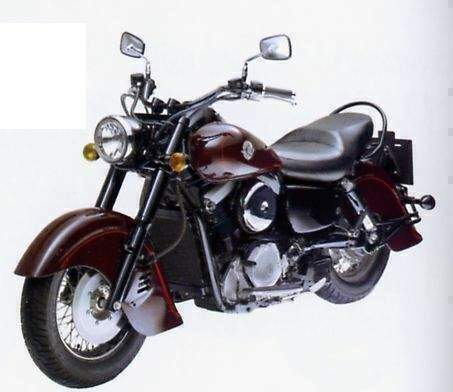 Using the liquid-cooled eight-valve engine from the VN1500, the Drifter has a slow-rewing, grunty power delivery, helped by its electronic fuel-injection system. A maintenance-free shaft drive transfers power to the wide 40cm (16in) back tyre and a five-speed gearbox is changed by a heel and toe shifter pedal. The chassis is similar to the VN1500, with a hidden rear suspension system. But it is the Drifter's styling which is most important. 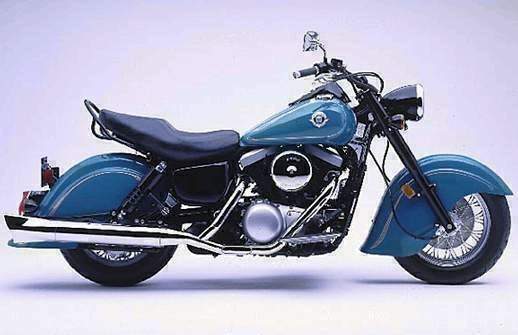 Taking its cues from the American Indian marque of the 1940s, the Kawasaki design team committed fully to the concept. At the front of the bike, a massive, deeply valanced mudguard shrouds almost the entire wire spoked front wheel, topped off by a small headlight and fat fork shrouds. A seamless teardrop fuel tank leads back to the well-padded solo seat, and another bizarrely deep mudguard. 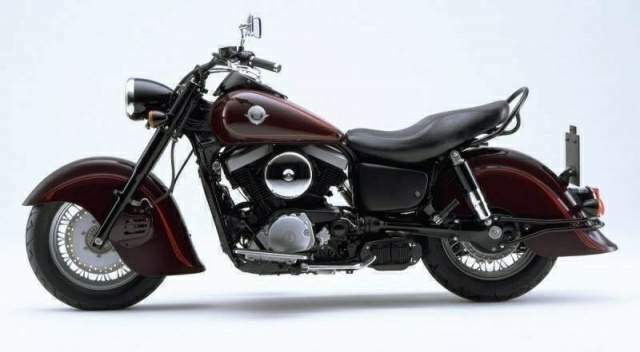 The whole arrangement is underlined by a snaking, chromed exhaust pipe which ends in a fishtail slashcut pipe. The Drifter has less chrome plate than other cruisers - 1940s Indians didn't have much chrome either, and many metal parts are finished with a gloss black paint. Riding the Drifter is much like riding many other large cruiser. The engine quickly revs out, and changing up at 3500rpm gives the best progress. Top speed is around 185km/h (115mph), but the wide bars and no wind protection makes keeping this speed up hard. There's little ground clearance, and the suspension and brakes are rather unsophisticated. Kept in town or on slow highway cruises, however, the Drifter is a civilized ride. Many riders customize their Drifter with some of the extensive catalogue of factory and aftermarket custom parts available.